Looking for Annapolis custom remodeling experts for your kitchen or bath? Count on Heidler, Inc. to get the job done. Call us today at (410) 268-7191 to schedule a free estimate appointment. Are you planning to start a custom remodeling project in your kitchen or bathroom? Make sure you receive the best results with an established plumbing team by your side. Heidler, Inc. has been the preferred neighborhood plumber since 1947. 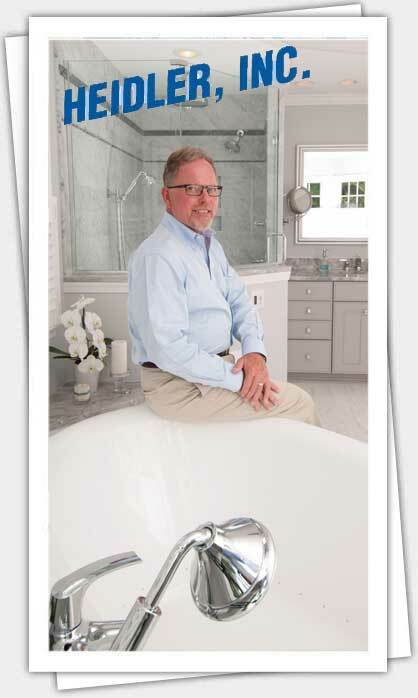 We are your local Annapolis custom remodeling experts for kitchen and bathroom plumbing renovations. Whether you need to meet ADA requirements, move your current shower or tub, or update your kitchen, we will get the job done on time and on budget. Click here to see how we have helped your neighbors with their remodeling needs. What are the benefits of working with a professional plumber? Our licensed Annapolis plumbers are up to date on all local plumbing codes. When it comes to upgrading your kitchen or bathroom, we can successfully make the required changes to your plumbing while keeping your costs down. We will handle the paperwork for obtaining the required plumbing permits. You will not have to worry if your remodeling project will be compliant with local code. Heidler, Inc. makes sure every step of the process meets or exceeds required standards. If your bathroom was installed before the early 1990’s, you may have discontinued finishes, obsolete fixtures, and faucets or toilets that are using too much water. A bathroom remodel will not only add value to your home by updating your bathroom to a more current style, but can reduce the water usage in that bathroom by up to 50%. New toilets use only 1.28 gallons of water per flush vs. the 3.5 gallons per flush models previously available. New shower faucets use only 2.5 gallons per minute vs. the 5.5 gallons per minute used by older faucets. Have you encountered a situation where parts were no longer available to repair your leaking faucet? This can often result in a replacement that does not match the rest of your existing bathroom finishes, leaving you dissatisfied. Our custom remodeling experts are waiting to help you create a bathroom that is not only aesthetically pleasing, but also water and energy efficient. What are signs it’s time to make ADA upgrades? If you’re concerned about aging parents, are disabled, or experience limited mobility but want to enjoy the freedom of living comfortably at home, ADA upgrades can help you enjoy a better quality of life. Making ADA upgrades used to mean your bathroom could end up looking institutional, but with new stylish, innovative bathroom fixtures, this does not have to be the case! Comfort height toilets and vanities are taller than standard fixtures, which reduces stress on the knees and back. Grab bars come in many styles and finishes, and can be installed in the tub, by the toilet, or in transitional locations to provide additional safety and assistance where you need it most. Have you considered a walk-in tub? A walk-in tub incorporates the therapeutic benefits and luxury of a whirlpool (hydrotherapy) tub, with options for aromatherapy, chromatherapy and thermotherapy, and is perfect for those with limited mobility, arthritis, pain, stress, and other debilitating conditions. A walk-in tub is an elegant solution to regain your independence. Keep your home looking fresh and well maintained with a kitchen or bathroom remodel. Our technicians are skilled at completing remodeling projects to suit your needs while staying on budget. We always make sure the finished product is something that will give you years of enjoyment and convenience. Your remodeling project will be handled from start to finish by our custom remodeling professionals, who will assist you in getting the bathroom or kitchen of your dreams, every step of the way. Leave all of the work to us and enjoy the final results. Ready to upgrade your kitchen or bathroom? Look to your Annapolis custom remodeling experts at Heidler, Inc. Receive superior results and unmatched customer service when you call (410) 268-7191.